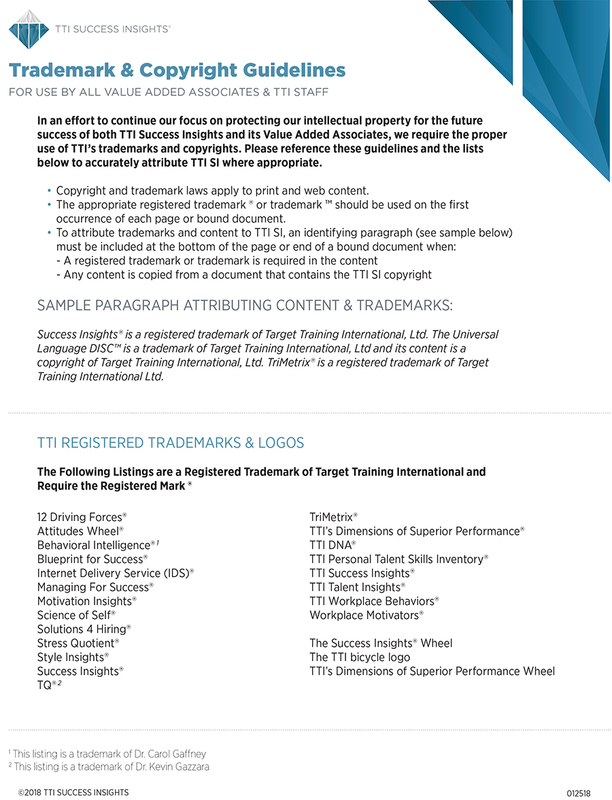 Managing For Success, Success Insights, and Talent Insights are registered trademarks of Target Training International, Ltd. All rights reserved. Style Analysis; IDS; Internet Delivery Service; MFS Personal Interests, Attitudes and Values; Attribute Index; MFS Sales Strategy Index; OD Surveys; Interactive Insights; Blueprint For Success; MFS Employee-Manager; MFS Work Environment; MFS Time P.L.U.S. ; Dynamic Communication; Your Attitude Is Showing; and TriMetrix are all trademarks of Target Training International, Ltd. All rights reserved. Adobe Acrobat Reader is a registered trademark and trademark of Adobe Systems, Inc. All rights reserved.